The mosaic, which stretches about 30,000 pixels width, includes 57 images taken on Sol 1228. Mastcam also has a change detection observation of the target “Hebron”. On Sol 1229, Mastcam will repeat that change detection observation two more times. Mastcam also has observations of the dump piles from the scoop target “Gobabeb”, plus a Mastcam and Navcam photometry experiment. ChemCam will take passive spectra of the Gobabeb dump piles, followed by active analysis of dump pile A. 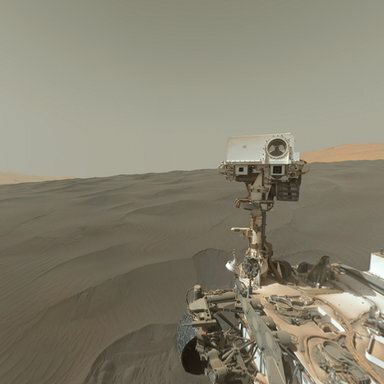 That will be followed by atmospheric observations by Mastcam and Navcam. In the afternoon on Sol 1229, ChemCam will analyze dump pile B, and Mastcam will take another change detection image of Hebron. The Mastcam and Navcam photometry experiment will also collect a few more images on sol 1229. What is that face in camera? Why is a huge chunk cut out? Thank you for taking us Earth bound Astronauts on this amazing journey to Mars ..